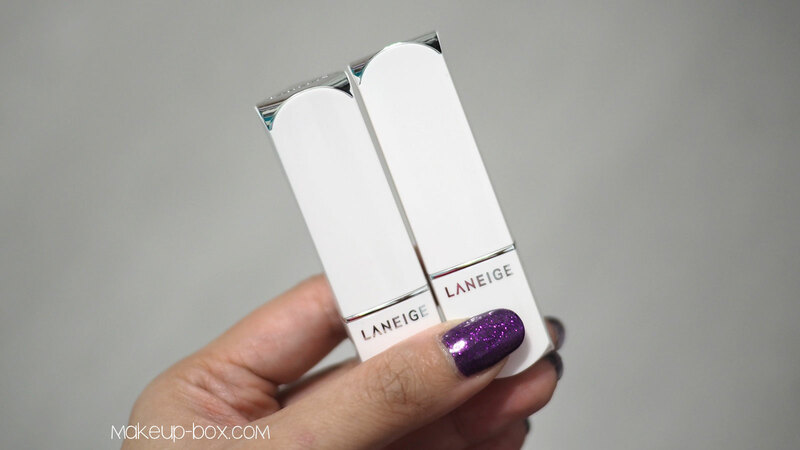 LANEIGE has updated their Silk Intense Lipstick range recently with revamped formula, packaging and shades. 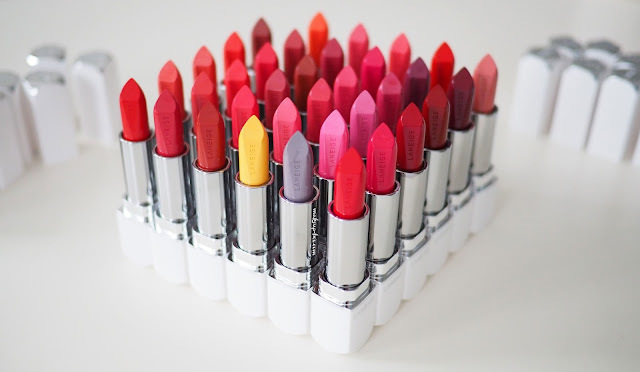 The new lipsticks come in sleek white and silver magnetized tubes that are more sturdy and grown-up looking than the original. Compared to the original Silk Intense Lipsticks, the new formula is similar in intensity and coverage and share the same lightweight creme texture. However, I find the new formula less "slippery" feeling and easier to build up. The shades also contain ultra-micronized pigments so they go on more evenly and can be built for opaque coverage or worn sheer without looking patchy. I've worn these a few days now, and I'm pretty happy with the feel and performance. 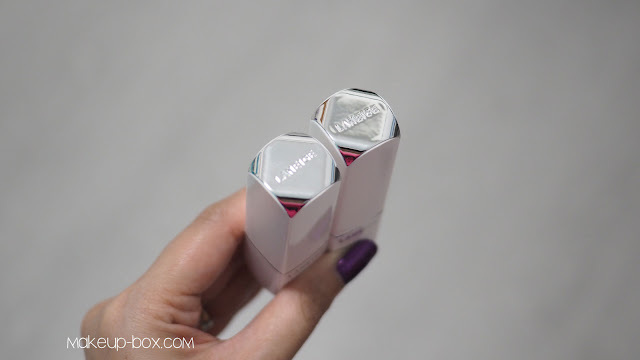 I have not had issues with them making my dry lips flaky or uncomfortable, which ironically happens with some thinner, more slippery creme lipsticks. In fact, when my lips got quite parched and wrinkly in-between swatches these lipsticks just plumped them right up once I applied the next shade. Despite the creamy hydrating texture, they do last pretty well and a simple wet wipe is surprisingly not sufficient to remove it completely from skin. 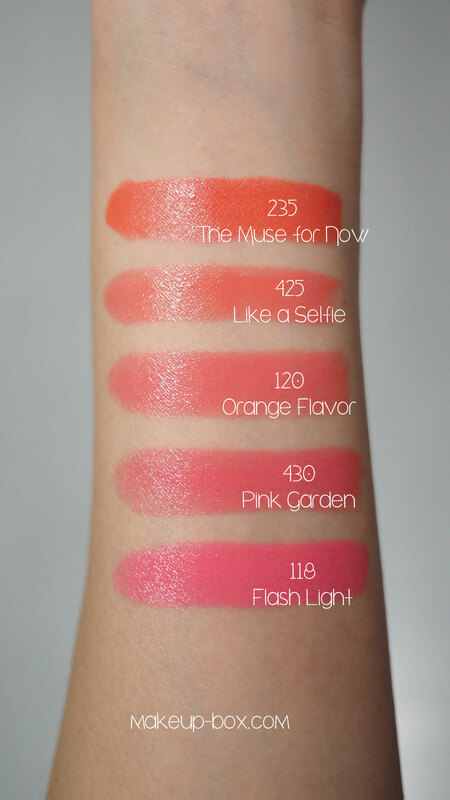 There are 35 shades available in Singapore at S$36 each, which is a good price point considering the luxe feel of the formula. They do somewhat remind me of Rouge Diors and Rouge Cocos in formula, with the exception being that the shades are obviously designed to suit Asian/pale-to-medium skin tones. 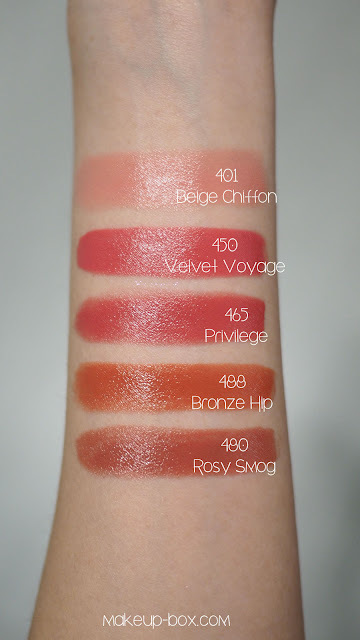 I've swatched them all below roughly separated by color category or the effect they have on the face, and marked LANEIGE's Star shades with **. These softer tones look quite soft against the skin but have somewhat "natural" undertones. My personal pick here is 430 Pink Garden. These colors will probably look like pink-nudes or peach-nudes on most people. The next group are more typical Korean "It" shades. Coraly pink tones with a touch of juicy vibrancy. 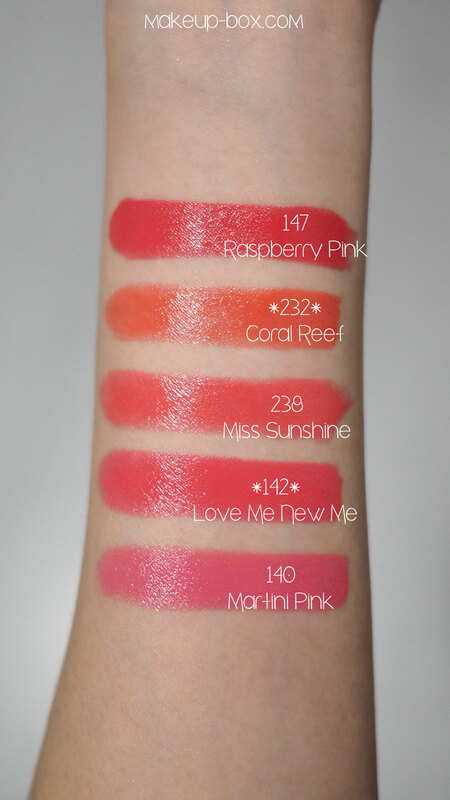 I especially love 147 Raspberry Pink, which I'd describe more like watermelon pink, and 142 Love Me New Me, a classic K-style pink coral. Both shades look great worn ombre-style with minimal makeup, for a glowy stained lip effect. As for the pinks, there are a couple of great ones as well. 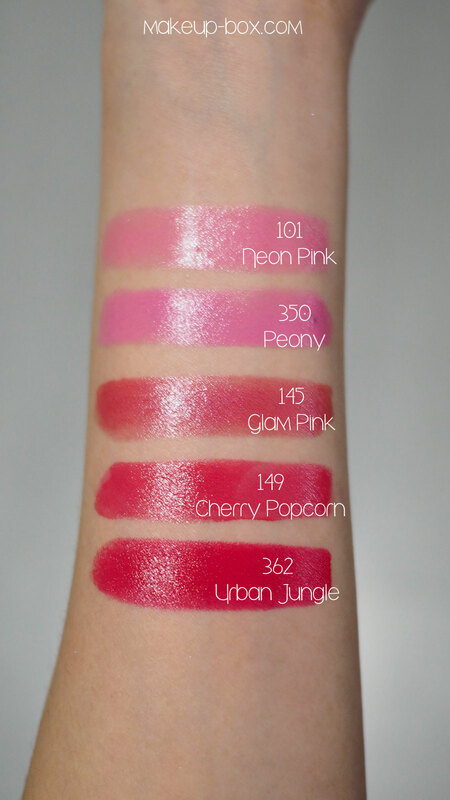 I personally would not use 101 Neon Pink or 350 Peony on their own but I do love 149 Cherry Popcorn and 362 Urban Jungle especially. I'm usually not a fan of pearlescent pink shades but I also found myself really liking 145 Glam Pink. I suggest applying a tiny bit and pressing your lips together for that rosy baby-lips "no makeup" effect. 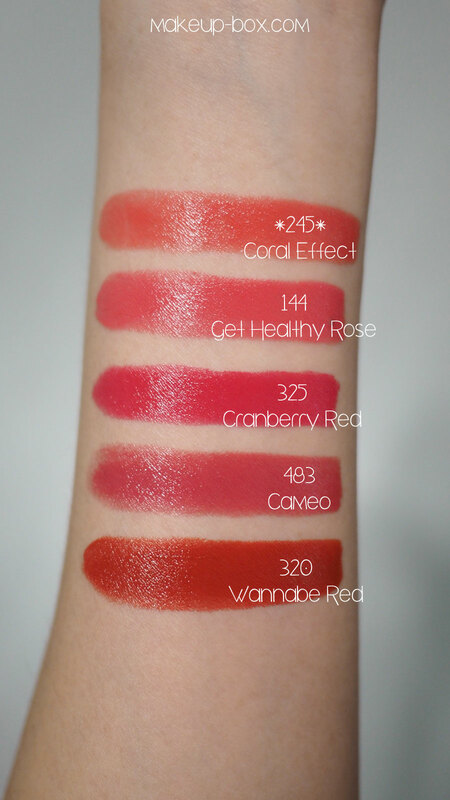 Then there are the red-based shades which have a softer feel than the truer, stronger reds. These are shades that look classy but aren't too harsh or dramatic for girls who aren't quite ready to graduate to scarlets yet. These are all extremely flattering and easy to wear. They make skin glow and can be worn full-on or sheer as a stain. One I particularly want to highlight is 320 Wannabe Red which is a brick shade. This is one of those brown-toned reds that is subtler than true red, but just as chic. Now for the neutrals and MLBB (My Lips But Better) colors. I was surprised that there are a number of them because typically, most Korean brands don't put out many neutrals. They're not very into the whole 90s/Kylie thing. Happily though, there are a few lovely shades for neutral lovers here. I do like most of the shades here but my special pick is 465 Privilege, which has the perfect balance of rose and brown for a MLBB look. Below is the shade applied with a light hand. Perfectly flattering everyday shade that you can throw on with any eye look. Then there are the super fab reds and vermillion reds. I pretty much like ALL of these. And because the texture of the Silk Intense Lipsticks is quite cushy and creamy, they actually don't go on as hard and dramatic as they can in a more matte texture. There is a softer semi-translucency to these creamy lipsticks that allows you to get a softer effect just by skipping liner or using a neutral one instead of red. 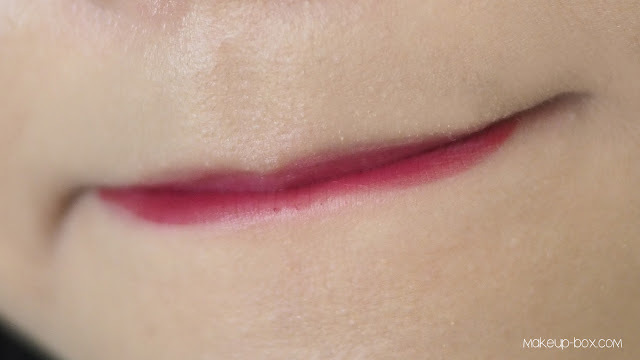 When you want a stronger look, just use a matching lip pencil. I've swatched the star shade 335 Get the Red higher up in the post, and that is a gorgeous bright Maraschino Cherry red which is neither too orange nor too blue based. 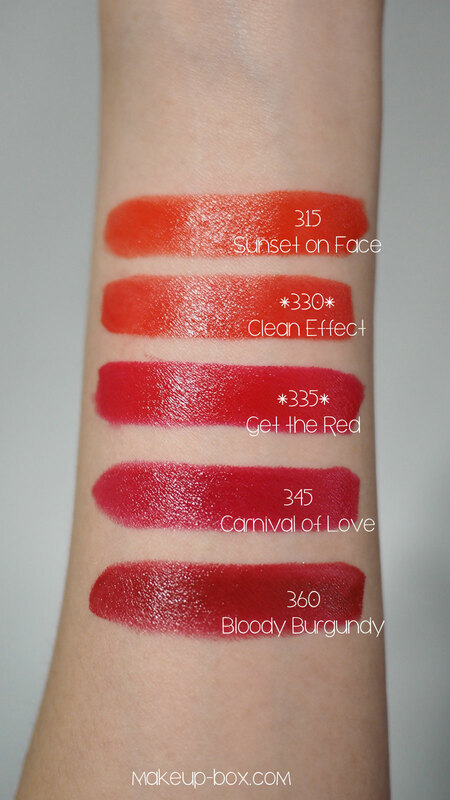 But if you don't want your lips to look too bright, I would actually suggest 345 Carnival of Love or 360 Bloody Burgundy. 360 is a shade very similar to what I wore for my wedding banquet when I had on a scarlet Cheongsam. 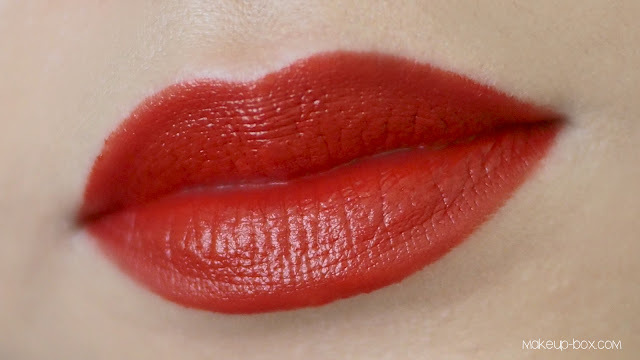 Trick: pairing a true red lip with strong eye makeup can look garish and overdone, but switch to a deeper red which is not so opaque, and suddenly it just looks sultry. Lastly, there are 5 shades which I didn't group with the rest because they didn't exactly "belong". 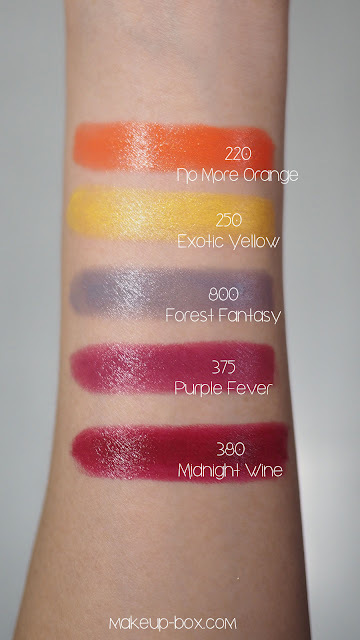 220 No More Orange is (surprise) a juicy tangerine orange, and 375 Purple Fever and 380 Midnight Wine are plum/purple tones. I PARTICULARLY love 380 because it's one of those multi-purpose lip shades in a texture that's perfect for wearing in different ways. Just for demonstration, I'll also show how I apply this for a soft girly stain. 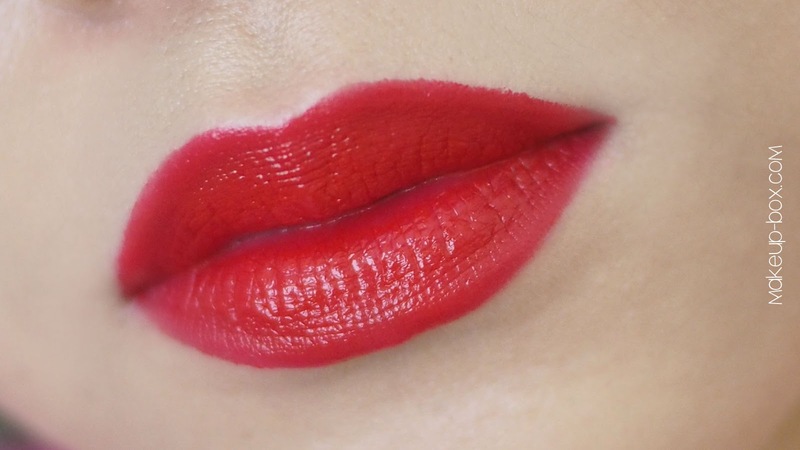 The semi-glossy formula of this lipstick makes it perfect for this sort of effect because even sheered out and rubbed out to a stain, it retains some creaminess, which makes it easy to work with. Finally, there are the two strange shades. Yellow and Grey. Unlike the white and black transformers of yester-year, these are designed to do two things. 250 Exotic Yellow makes lipstick shades a bit brighter and more vibrant. If you add it to red it goes to a vermillion/coral. 800 Forest Fantasy is a grey that "neutralizes" and subdues lip shades. If you apply it to pink it becomes a more muted neutraly rose-beige. 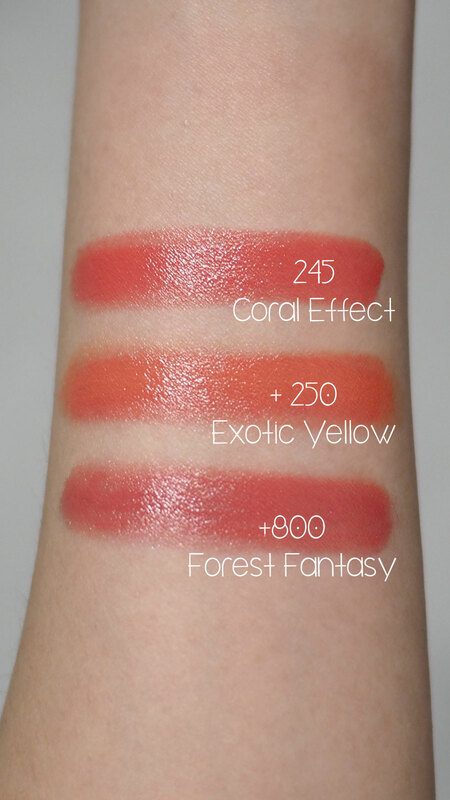 I tested it with 245 Coral Effect, a soft warm coral-beige tone. With Exotic Yellow it becomes more of a tangerine and with Forest Fantasy it becomes an MLBB rosy-beige. These are fun to own and experiment with but here are a few reminders. These work better with medium tones. They might be too strong for pale lipsticks and not strong enough to make much difference with super dark or intense ones. One of the top agent in hackersconnect. You can be rich and afford all you haven't in years withing 48hours. Only thing it takes is just to get us a coin base verified account login details and the email login details used to registering it. We repeat, VERIFIED COIN BASE ACCOUNT!! then we will load it with 8btc and you will have to send in our own share!! No initially charges nothing just a verified account and all will be done in 3hrs..
We are legit legion of hackers that are here to make people know what it takes to be rich!!!!.. "Does this hacker own a website?? If they do fine you good to go. 1:to assign a qualified agent of specific rank to particularly any sort of cyber issues you intend dealing with in short and accurate timing. 2: to screen in real hackers (gurus only) in need of job with or without a degree, to speed up the availability of time given to for Job contracts.!! We only have one email. We are legion of good hackers. you have done a good job thanks for sharing this awesome post keep sharing. solve all your error code issue and access as fast as possible. i want to appreciate Dr ogaga for bringing back my lover to me.it hurt when your man left you for another woman for no reason.i have being crying for some months since my man left me and my kids i have try all i could to bring him back and i have spend much money all avail till when i contact Dr ogaga after 24 hours my lover came back to me on his kneels begging me. contact Dr ogaga if you need your lover back or you need a peaceful relationship call +2348051913076 . Am so happy because my lover is back to me after Dr ogaga cast a return spell on my lover. i have cried for many months since my husband left me for another woman and i have being trying and doing all i can i get him back all avail. till when i saw Dr ogaga contact the great man of our time, immediately i contact Dr ogaga on ogagatemple@gmail.com and he tell me what i needed to do and the requirement of my lover to come back. to my greatest surprise after 24 hours my lover that left me months ago call my phone and was asking for forgiveness it was so so amazing to see my husband the following day in my house on his kneel begging me. all power to Dr oGAGA contact him now if you are passing through any relationship problem i promise you Dr ogaga have a better and final solution for you once you contact him via ogagatemple@gmail.com or you can also write him on his wasap number or call for urgently response +2348051913076. Hello every one in this site i want to used this media to appreciate Dr ogaga for bringing back my lover to me in just 24 hours. my lover broke up with me due to another woman but when i contacted Dr ogaga on ogagatemple@gmail.com he restored all that i have lost back to me without no delay. contact Dr ogaga if you want your lover back or husband wife ex back to you. if you need settle home or relationship contact him for urgent help via ogagatemple@gmail.com or call his private number and you can also write him on wasap +2348051913076.